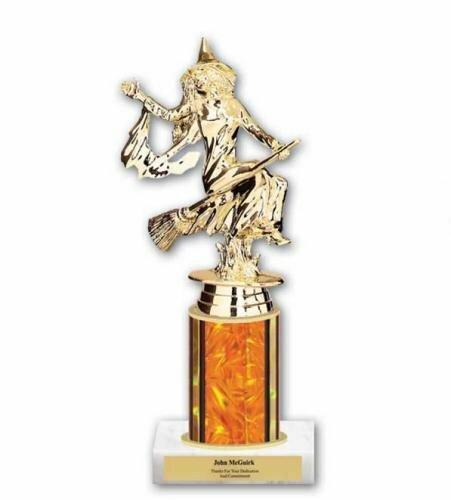 If you're having any sort of Halloween contest, this variation of our classic participation trophy can be customized without casting a spell. Gold witch figure is approximately 5" tall and sits atop column of various heights; includes personalized plate with three lines of lettering. Add your choice of height to your shopping cart and use our unique trophy builder technology to choose column, base, and lettered plate. Each front color imprint, sublimated upon a gold, silver, bronze, or white insert, is custom designed ($10 design fee added when insert color is selected) for you to add your event information or other text (samples shown for example purposes). 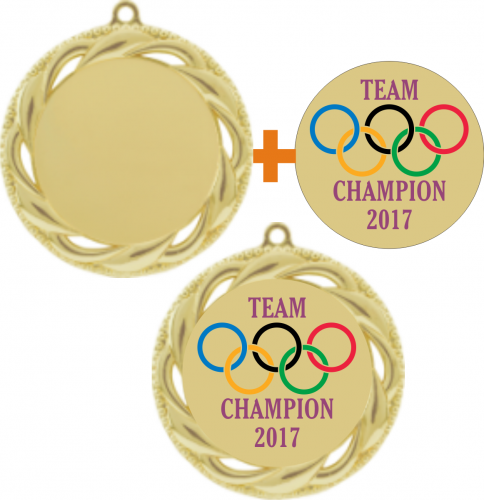 Combine with a gold, silver, or bronze metal medallion frame, your choice of color neck ribbon, and optional back engraving (additional cost) and you'll have awards as unique as your event. 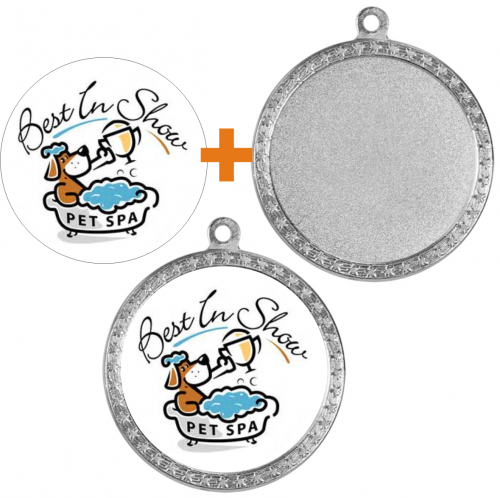 Color imprint is 2" diameter, overall medal size is approximately 2.75" diameter. Halloween is really the holiday of disguise, so our "morphing" mug sets the stage. 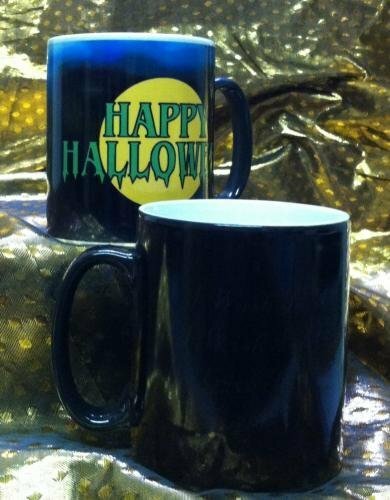 11 oz ceramic mug is black when its temperature is cool, but add hot liquid and your personalized Halloween message appears. As the mug starts to cool again, it returns to black. Lots of fun for all ages, use at the office to amuse your co-workers or surprise the kids with hot cider. Click on "Morphing Mug Designs" under Customization Options at right of this screen to see thumbnail images of our morphing Halloween designs. Text decriptions and personalization notes are shown below. Place in cart to order online, select your design, and select in-store pickup or other shipping method. Specify your personalized message(s) in the dialog boxes on the ordering page. Glowing Pumpkins: When the mug is heated, five glowing pumpkins and your personalized text appear. Customize by adding to or changing the "Happy Halloween" text at top. Green Halloween: Not a fan of the traditional orange Halloween color? Try this combination of greens and yellows, with your personalized message, to create spooky ambiance. Moster Below: Mugs usually stay heated at the bottom the longest, so this bottom-peaking monster will keep your viewers wondering. Add your customized message in the large area above monster. Owl Eyes: We think this image works great without any text, but we'll add your personalized message in an intriguing manner. Spider Webs: When heated, just the white webs and personalized message will appear. Please specified your desired message. Witch Silhouette: One of our favorite mug designs, with your personalized text, we think you'll be bewitched. Need a quick, fun, and inexpensive way to accessorize this Halloween? 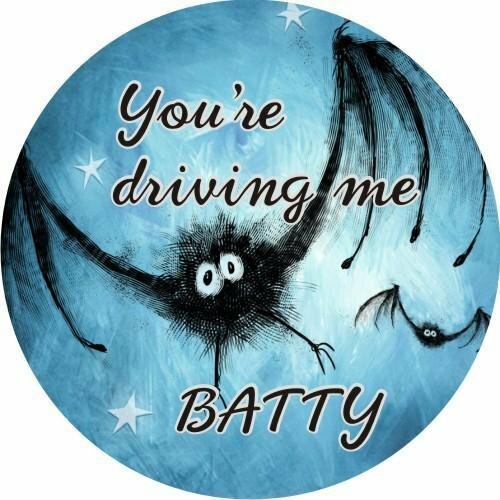 Choose from one of our stock Halloween designs (see "Halloween Pin Designs" under Customization Options to the right of this text), and your choice of 2.25" diameter or 3" diameter pin back button with plastic covering. You don't need to order a minimum quantity, and you can request your personalized lettering in place of our generic text shown. Great for office "dress up" day, including in party goodie bags, or giving as an alternative to candy. Place in cart to order online, choose design, specify text, and select in-store pickup or other shipping method. Halloween is a great time to add some creativity to your every day routine, so don't forget about your daily drinkware. 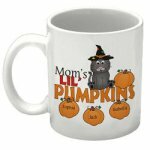 Our white ceramic mugs (coffee cups) come in two sizes, 11 oz and 15 oz, with several Halloween designs and personalization options to choose from. Click on "Halloween Mug Imprints" under Customization Options at right of this screen to see thumbnail images of our personalized Halloween imprints. Text decriptions and personalization notes are shown below. Bones: What keeps you from falling apart? Customize by adding your personalized message in our special "Bones" font. Cat and Pumpkin: There's room for two messages with this fun cat and pumpkin layout. 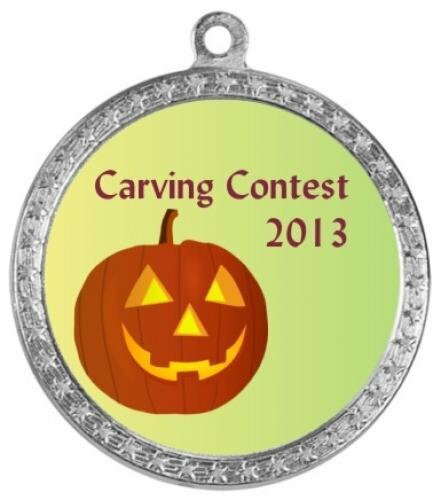 Or tell us what kind of jack-o'-latern face you like (scary, funny, traditional, etc.) and we'll design that into the pumpkin instead of text. Executive Costume: Not a fan of "costume day" at work? Hide behind this personalized mug. Halloween Helpers: How many "scary" Halloween helpers do you have? Let us know how many boys and girls (and/or pets) and we'll include them all, each sporting a different costume. Monster Below: This creepy guy appears to be holding up your personalized message. 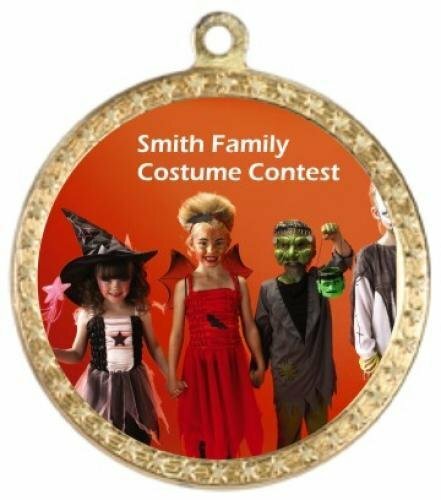 If you need awards for a Halloween event, these medallions are full of fun. Each front color imprint (see options by clicking Halloween Front Imprint under Customization Options to the right) is designed for you to add your event information or other text (generic text shown for example purposes). Combine with a gold, silver, or bronze metal medallion frame, your choice of color neck ribbon, and optional back engraving (additional cost) and you'll have awards as unique as your event. 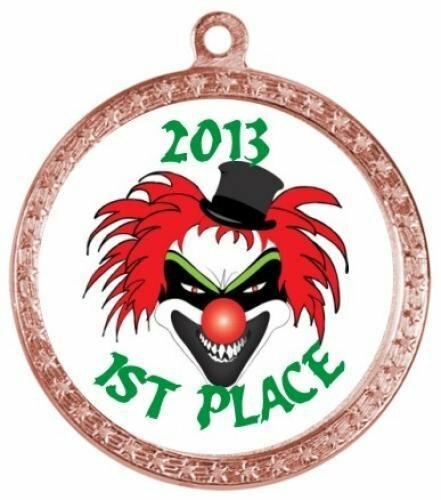 Color imprint is 2" diameter, overall medal size is approximately 2.75" diameter.